Of course our big day this month is Halloween. You can have so much fun with this holiday. Staff should dress up (review/develop policies regarding this), menu items should reflect the day; you can even use the weekend before to build up to it. Lots of treats that you can make and sell ahead of time in bulk and market to those having home parties by providing appropriate trays and desserts. Decorate following the Fall/Halloween Theme. Have pumpkin carving contests and display the end product. Healthcare/Corporate Dining can involve all departments in this type of fun. If your area participates in a Trick or Treating Event then see how you can participate - talk with the Chamber of Commerce and see if they are involved. 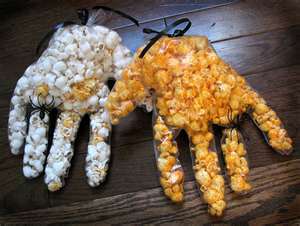 Fill 1 x-large clear plastic food handler's glove with popped popcorn (assorted varieties/seasonings) and tie up with black/orange ribbon - put a plastic ring (spider, skull, etc.) on one of the fingers. This item is great as it can be given to children for a treat or you will find that many people will just purchase to sit on their desks - try it - easy, inexpensive and makes a great treat, party favor, gift or decoration. Check in with local schools/PTAs and promote the trays and services you can provide to assist in any events they may have. Also remember to offer coupons or promotions through any flyers they produce. Of course by now you are ready for the holidays and you should start your advertising and promoting for those events and what you will be offering for on- site menus and services along with all those items that can be purchased for "Take Home" and if you are able offer outside catering. Promote your services and menu offerings to all the local organizations/clubs also. If you offer catering services then send out notices to all local businesses. The best response I ever had in this area was to reward the Secretary/Assistant handling the arrangements with a free lunch or dinner depending on what was booked and you can bet the next time something/place is needed they thought of me first.